Perhaps a little background first. The Drawing Club is an actual drawing club is real life based in Los Angeles where monthly drawing workshops are held. It was started in 2002 by Bob Kato, who's also an art teacher and now author. He has given drawing workshops at Disney so he has good credentials. I'm quite impressed by the commitment to run the club for more than a decade. Each drawing session features a themed character. And anyone can join in the evening after work to relax and just draw, check out other people's work, interact. Bob Kato writes in a lively manner that makes me feel the energy and enthusiasm from the club. This book is a culmination of drawing tips, motivation talk and work created by the members over the years. This is a figure drawing book in essence, one that focuses on storytelling, in other words, creating a drawing that the audience knows instantly what's going on. It's not an anatomy book so there's nothing on muscles, bones or that a figure is the height of 7-8 heads. The book is filled with tips on how you can draw an expressive figure, and also to make drawing more fun. Some examples are like giving a story to the posing characters, mixing media to try different styles, using different paper sizes to practice composition, playing with thin and thick lines, thinking about shapes and contours. Bob Kato talks about lessons you can learn and the inspiration behind the artworks contributed by the members in the book. Every chapter has some exercises that allows you to experiment with different aspects of drawing. It's more on the purpose rather than the technical aspect of how you can render a specific effect. Why is 2-D design so important? 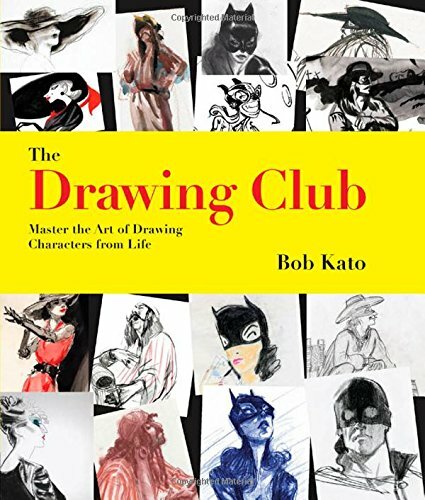 It's an inspiring and helpful book should appeal to those into figure drawings. If you like this book, also check out other figure drawing and gesture drawing books that I've reviewed.